Remember how Eurocontrol used social media to update travelers in the aftermath of the Icelandic volcanic eruption? 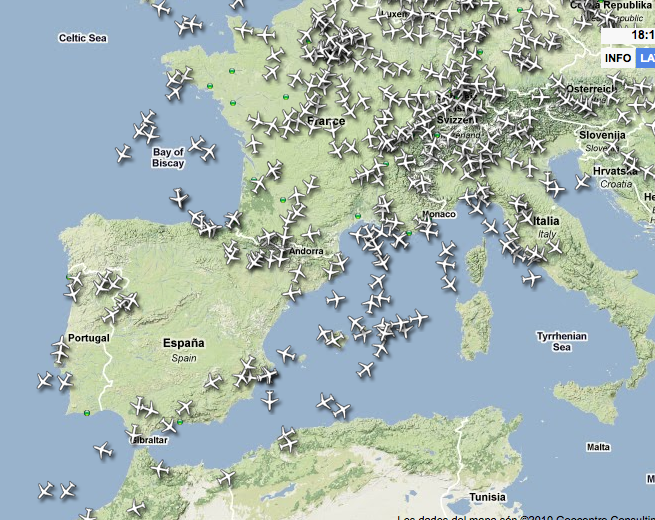 Another crises, this time the Spanish Air traffic controllers strike, has caused the whole Spanish airspace to shut down. And AENA, the Spanish air traffic management organization has responded by using social media. A brilliant analysis of the situation has been done by Miquel Ros on the AllPlane blog, and they’ve kindly allowed us to re-post their article here. It’s quite insightful as to how the events have unfolded. Enjoy the read! At the time of writing these lines the effects of the Spanish air controllers unannounced and almost total strike are still being felt throughout the whole South-Western European airspace. This industrial action has forced the closure of the entire Spanish airspace and gravely affected that of the surrounding countries (Portugal, Morocco), the chaos at airports has been total, more so when the controllers’ walk-away has coincided with the start of a five day holiday in Spain. The Spanish government has had to recur to extreme measures such as declaring the “state of alert” and putting the ATCs under military control. It is not my intention here to delve into the causes of the crisis or on the chronology of the events , but to look at how the different actors of the crisis have been using social media to get their message through. In fact when the crisis started all the social media artillery seemed to be on the side of the air traffic controllers, that had their own blog and at least two Facebook fan pages presenting their point of view (this one seems to be the main one, but has much less activity than this other page that is focused on the current conflict…This put them automatically on the spotlight, with thousands of angry people directing their anger at these platforms. The Spanish ATC Twitter account was replying to comments and actively tweeting until Saturday morning when it seems that it stopped tweeting (the deluge of mostly negative comments was possibly too much for whomever was managing this account). 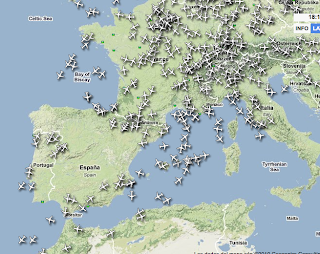 Snapshot of Radarvirtuel around 7pm CET, air traffic returns slowly to Spanish skies, spot the empty region in Central Spain and around Madrid airport (MAD). The government side did not have this sort of social media channels in place when the crisis started to unfold. Spain’s airport and air traffic management organisation (Aena) had an institutional website that was in no way suited for this task, providing just some informative notes and a contact telephone. There was no Twitter account to speak of until Saturday mid-morning (more than twelve hours after the strike had started), when the official Aena Twitter account was opened. The first time I checked it out it had only two followers and they had not even had the time to upload an avatar picture for their Twitter profile. To their credit however, they got up to speed fairly quickly, I checked it again 15 minutes later and it had already over 1000 followers, by early afternoon they had reached 3000 and it was tweeting a constant flow of information on Spain’s airport network situation. Besides English and Spanish it had also streams in the other official languages of Spain: Catalan, Basque and Galician. We hope that, as in the volcano crisis, this level of engagement with the public will remain going future. most of the tweets related to these hashtags are in Spanish, but quite a few are in English too. And obviously Eurocontrol, was also informing via Twitter, by the way, it must have been a complicated day for them since there were not only issues in Spain but also closures and disruption due to snow at Schiphol (AMS), Paris-Orly (ORY) and UK airports such as London-Gatwick (LGW). Other unexpected side actors of this crisis have been Hotel Auditorium, a huge hotel next to Barajas airport with its own twitter account as it is in this hotel that air traffic controllers were holding a meeting on Friday night while the crisis was at its peak. They required police protection after the ATCs were discovered by a number of distressed passengers that had been hosted at the hotel after their flights got cancelled (as a side note, I also had the chance to stay at Hotel Auditorium earlier this year after my flight was cancelled due to an air traffic controller’s strike in France). I have also seen the potential of Twitter as a tool to arrange alternative travel plans, for example, I have spotted several people on Twitter looking for car-sharing arrangements to travel by road to their destinations as well as some online car-sharing companies, such as Comuto and Amovens, promoting their services. And other online services that thrive with public attention in days like this are the air traffic live monitoring sites, such as FlightRadar24 or Radarvirtuel, that I already used, with spectacular results, during the volcanic-ash crisis. I guess that kind of seals it. Social Media is here to stay and is now being used by all those involved in an event. Since the volcanic ash episode the use of social media in times of crisis or mini crisis as the case maybe has become vital. The fact that AENA started a twitter account and managed to get followers in the span of 6 hours not only to counter the ATC moves but to also provide information as a public service in many languages is a tribute to Social Media. AENA is to be credited for moving from a legacy website to a real time interactive media in the span of less than a day.